Happy New Year! 2017 Done. Here's Our Solar Outlook for 2018. As we say goodbye to 2017, we want to thank you all for the support and love! As we venture into this new year, let’s talk about all the things to be aware of and look forward to in the Solar World. We're in Uncharted Waters. AKA Trump Tariff Limbo. Like Sharks with Lasers. Get solar now. Trump could increase the cost of solar by $2,000 on November 13th. With only a week left until the International Trade Commission is due to give their recommendation to President Trump, if you’re considering going Solar, now is the time to make the switch. There has been a lot of talk in the White House regarding possible tariffs to be placed on imported Solar Panels. The American Solar Industry could be in for a dramatic blow from the Trump Administration on November 13th. At our office last night, we hosted a discussion on battery technology led by climate writer and educator, Ben Jervey; the author of The Electric Battery: Charging Forward to a Low-Carbon Future. In the aftermath of hurricane Maria, Brooklyn SolarWorks and other NYC installers banded together to donate supplies to a solar relief project in Puerto Rico…. Last Thursday, the Solar Canopy won Interior Design Magazine’s Green Innovation Best of 2016 Award. We are the only solar company in the U.S. to be honored with an award from the prestigious Interior Design Magazine. 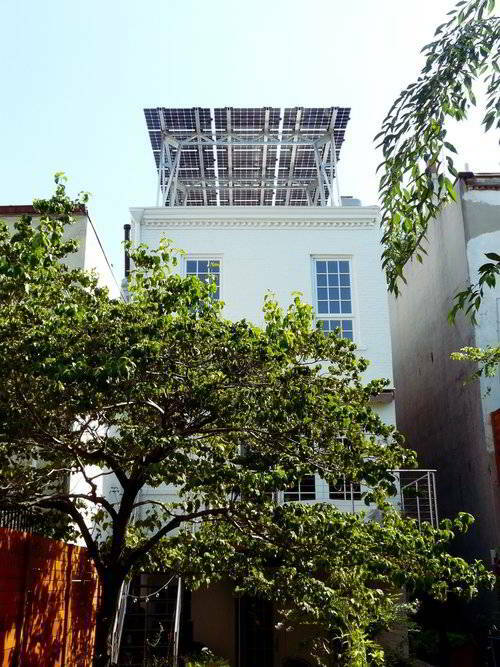 Happy Thanksgiving from Brooklyn SolarWorks!